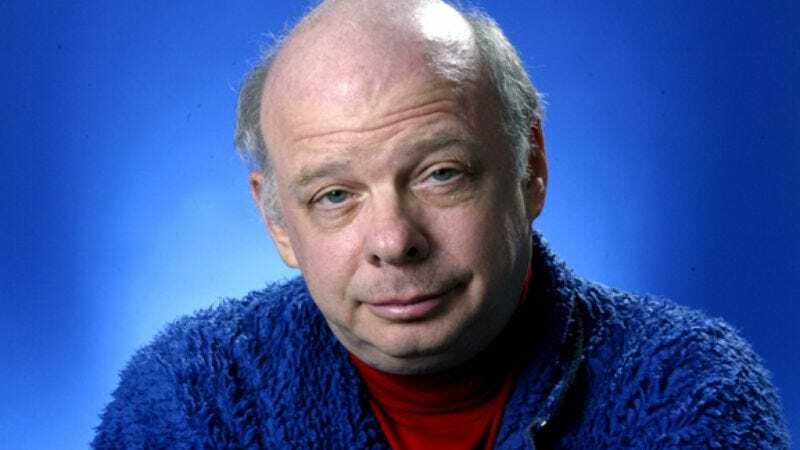 The actor: Wallace Shawn has a curiously bifurcated career as an incendiary playwright whose work often digs into dark, troubling subject matter, and as a popular, hard-working character actor/voice artist who specializes in playing milquetoast bumblers and sniveling schemers. Not bad for a man who never set out to be an actor in the first place. Shawn made a memorable impression as a sexual dynamo in Woody Allen’s 1979 classic Manhattan. The son of legendary New Yorker editor William Shawn, Wallace has worked steadily in film and television since then, most memorably in the 1981 cult My Dinner With Andre, which he co-wrote; 1987’s The Princess Bride;and 1995’s Toy Story and its sequels, which cast him as the voice of Rex the dinosaur. Shawn has also written the screenplays for adaptations of several of his plays, including Marie & Bruce, a funny, uncompromising look at a relationship in crisis starring Julianne Moore and Matthew Broderick. Marie & Bruce has just been released on DVD. AVC: What was Marie & Bruce’s path from stage to screen to DVD like? WS: Well, I can’t conceal from your readers that I have been alive probably more than they think is appropriate. So I wrote the play in the late ’70s, and it was performed in 1980 with Bob Balaban and Louise Lasser and many other wonderful people. If you believe as I do that movies can show any aspect of life, including the fact that people often have conversations that are very important in their lives, then you would agree that Marie & Bruce is a very plausible movie idea. And there was a time when John Malkovich was going to direct a movie of it. It was set up, paid for, all set to go, and it fell apart. WS: That must have been… somewhere back there in the past. That must have been 15 years ago, I’d say. Really. In the ’90s, I think. AVC: Would he have starred in it as well? WS: Yes. That was going to be the idea. But that didn’t happen, so it languished for a while. Julianne Moore had always loved that play, before she ever met me. She and I knew each other because we did Uncle Vanya together for years working with Andre Gregory. Louis Malle finally made the film of our work, Vanya On 42nd Street, so she said “If Malkovich is not going to do it, maybe it could be done in which I could play Marie.” And I asked my friend Tom Cairns… This is, like all movie stories, you could spend 25 hours describing many different stages that Julianne and I went through. But ultimately I asked my friend Tom Cairns, who is an Irish director who has directed film, theater, and opera, to direct the movie. And he and I wrote a screenplay together, and we hired Matthew Broderick to be Bruce, and I think it’s a great film. It’s a masterpiece, but you kind of have to be prepared for a strange style, or it’s going to seem like a big mistake. It’s actually on purpose, the way it is. On purpose because I have a strange way of writing, and anybody who likes my writing would like this movie, but it’s not a conventional drama. Certainly not a conventional comedy. It’s in the very stagy style which happens to be how I write. It’s quite passionate and beautifully acted, but it’s not what people think of as realism. AVC: It seems like there’s an emotional realism. WS: I think I’m trying to write truthfully about life, and naturalism, or the way people normally talk in movies, is a convention. It’s not the way people talk in life at all. To me, the way I write is about life and is quite truthful, and I think there is a kind of brutal side to the relationship, and to the feelings, that makes it somewhat painful, but I think it’s a very intense portrait of the relationship of two people. And also, a bit about what people feel like when they’re alone, because it all takes place in one day, and during the day, they spend a lot of time alone in their different—you get to imagine what their fantasy lives are like, in a certain way. AVC: Your plays are known for being dark and uncompromising. Do you think there’s a reason you’re drawn to that sort of material? WS: Well I suppose I grew up in a very polite family, and I suppose my parents were both very polite, and from the time I was a young boy, I suspected that there were passions seething underneath and not being mentioned, and that was something that came to preoccupy me. Somehow I had some drive to write down what people might really be thinking. AVC: What do you think was lost and gained in turning Marie & Bruce into a movie? WS: Well, I don’t think too much was lost, because it’s a very difficult piece to do as a play. What’s gained is that you can have very intimate conversations in a film and you don’t need to shout. In a play, people are trying to project their voices and trying to be understood by a large group of people, some of whom may be sitting very far away from them. And that technical requirement cuts into the intimacy of theater. You’re always fighting the contradiction between the supposed intimacy of a two-person conversation and the blunt reality that you’re trying to sell the play to people who are sitting maybe too far away from you. Film comes to you, and it can genuinely be intimate and acted very quietly and subtly. And I feel that’s what Julianne and Matthew do. Also, of course, it’s very fun to play around with having—there’s a party in the movie, and we get to have a lot of people, which you couldn’t really do in a play, and there’s a dog who plays an important part who is only discussed in the play, and in the movie you can actually see that we have a very nice dog playing that role. AVC: That’s a golden retriever, right? WS: It’s a golden retriever, and he’s quite a famous one. Trevor, whose résumé—well, he’d be a very good subject for Random Roles. [Laughs.] He’s really been out there, he has quite the career. AVC: The film was made in 2003. Why did it take so long to reach DVD? AVC: It seems like all your plays have been divisive and have inspired intense reactions, favorable and negative. WS: Unfortunately, yeah. All of my plays have puzzled some people, and I’m happy to say delighted a few, but a lot of people have just not seen how quite to look at them. And this film… if you like my writing, you’ll like this film. If you don’t, you won’t like the film. It’s pretty faithful to—it’s a pretty uncompromising presentation of my way of seeing things, I suppose. To me, it’s very charming and rather beautiful, and I find the two main characters so loveable, but I think that many distributors felt “I don’t know how to sell this” and “I don’t think enough people are going to like it,” and ultimately I feel it’s totally unjust. It’s a miscarriage of justice that it was never theatrically released. AVC: Especially with actors of Matthew Broderick and Julianne Moore’s caliber. WS: To me, they should have had a chance to win Oscars for these performances, which are very beautiful. If they’d given those identical performances in a big-budget movie, they could have been nominated for any prize you could think of. WS: Well, I actually had appeared as kind of an extra previously in a film called Strong Medicine, by the avant-garde filmmaker Richard Foreman, who was really better known for his avant-garde theater. But that was a project which few people ever saw. Manhattan—well, first of all, I was a playwright. It was really not my idea to become an actor, but I had studied a little acting as a playwright, and done some workshops with Andre Gregory. And a guy called Wilford Leach, who died in the ’80s, he had the idea that I should be in a play that I had translated. And [casting director] Juliet Taylor came to that play, and she asked me if I would meet Woody Allen. So we met for probably 10 seconds, and then all of a sudden, I was going to be in this movie with him and Diane Keaton, which was a weird science-fiction type of experience for me. And actually, my call was for something like noon, but their schedule changed, and they called me early in the morning and woke me up and said, “Can you come down right away?” So it was literally like a dream; suddenly there I was. And they didn’t tell me how to play my part or what to do, but I had a script for my scene. I think Woody Allen thought I was inventing a bizarre character, but it was actually just myself. I think he said something after the first take like, “Now we have the extreme comical version, do one that’s a little bit toned-down.” But I barely knew what he was talking about. I was just being me being me, really. So I immediately, obviously, took to it. I enjoyed that amazing thing of being able to perform without having to sweat and struggle and get your performance out to people. There’s something that’s really so wonderful that the camera and the microphone come to you and you can give the quietest performance in the world, and they bottle it and bring it to the audience. AVC: Because your character in Manhattan is a sexual dynamo, were you worried about getting typecast that way? Were you concerned you’d be the Tab Hunter of the late ’70s? WS: It had not dawned on me at that point that I would ever be in another movie, or another play. I had a friend who worked as a messenger in the garment district, I’d worked as a Xerox-machine operator, copying people’s documents, and I just thought that this was a funny thing I was doing. It never crossed my mind that I would be an actor. But the fact that the part was written that way made my entire career possible and changed my life, because the way the part was written made my two minutes onscreen very, very noticeable. Because people had been curious throughout the whole film to see what that guy would be like, so they really paid attention. And I just sort of acted like myself for two minutes. I was doing nothing, it seemed to me, yet it turned out incredibly noticeable, and immediately, the possibility of other parts arose. It was just pretty amazing. WS: Well I suppose I was a little afraid of Bob Fosse, who seemed like a very far-out guy in comparison to myself. But it was very pleasant. I just remember sitting at a table with a bunch of people and again having a very protected feeling of being on the set of a film. It’s a magical world, and nothing bad is going to happen to you there. In a funny way, I still have some of that feeling. AVC: The first couple of films you were in were directed by Woody Allen, Alan J. Pakula, Bob Fosse, Marshall Brickman, and Louis Malle. It seemed like these were obviously people whose vision you could trust. WS: Yes. I mean, it was still a dream to me, and of course I was working with these great people, and I didn’t even quite realize how unusual that was, and it wouldn’t be happening again. AVC: Do you think it spoiled you for the more pedestrian things you did encounter further down the road? WS: Well, I wouldn’t say that, but I did start on a kind of A-list and then worked my way down. Which was fine, because I wasn’t taking it all terribly seriously. I wasn’t serious about having a career as an actor. It was completely accidental. In other words, it was not a thing I ever wanted or planned or thought about, much less dreamed about. If you’d asked me when I was 20 whether it would be more likely that I would be a deep-sea diver or an actor, I might have said probably a deep-sea diver. It never had occurred to me. WS: Having been in a few movies, it was possible for me to think, “This is a funny idea for a movie.” Andre [Gregory] had originally directed a play of mine, and then after the play, he dropped out of theater for a few years, as described in the movie. And then he felt he’d done that enough, and he wanted to get back into theater, and he said to me “How about we do a play of some description?” And because I had been in these other movies, the thought occurred to me, “Instead of doing a play—what you, Andre, have done is so interesting, and my reaction to it all is kind of funny. And maybe there’s a germ of an idea there of having these two contrasting guys, you and me. Maybe that could be turned into something interesting and amusing.” And there was a wonderful woman who worked at Public Broadcasting System, which was a rather far-out institution at the time, say 1978, and she gave us a grant. Her name was Sue Weil. She gave us a grant to transcribe hundreds of—we had conversations on audiotape, and with this grant, they were all transcribed. Hours and hours and hours of real conversation, which we had on tape. At first it seemed like there was no rhyme or reason to our conversation, but ultimately, I turned it into a script and we did it. AVC: So you found a through-line to turn these conversations into something with a dramatic structure? WS: It does have a structure. It has a very definite plot, beginning, middle, and end. Otherwise it would not be watchable, really. But the thought was that it would be subtle enough; in a way, people would feel they were just watching it be improvised, almost. And indeed, I don’t know how you would think this, it doesn’t quite make sense, but maybe people do think it was improvised. AVC: Like it was a documentary? WS: Yes. And maybe someone had some cameras and cleverly edited it together, God knows why. AVC: Was it difficult getting Louis Malle involved? WS: Well, it didn’t turn out to be difficult, weirdly. We had a mutual friend, and we thought he would be the perfect guy, because he was a really good storyteller in his films. His films were very gripping. He told subtle stories, but still very involving ones, which was crucial, to put it mildly. And he had a great sense of humor. And he was kind of rebellious. He had always been a rebellious kind, ready to take risks and do wild, unexpected things. And sure enough, he just responded to it. I think he identified very much with Andre’s character. It meant something to him, and he connected to it. And also I think he had—like many filmmakers, he was trying to get different projects going, and they weren’t going. Something fell through, or this and that. This was something we could just get to work on immediately. My memory is that we sort of agreed to do it about a week after we sent in the script. AVC: So it all came together quickly? AVC: But you had had a fair amount of success as a playwright at that point, right? WS: But critically, also. People thought they were bad. My translation had done nicely, of The Mandrake by Machiavelli. That had played for quite a while, people liked it, but my plays had been denounced, really. So Andre’s work had been acclaimed, but in avant-garde circles, and besides, he wasn’t directing a play, he was going to be acting, playing the lead role in a film. So it was absolutely unimaginable that Louis Malle would agree to do it, and yet he did. And we did not realize how wildly lucky we were. AVC: In that, and in the way it took off and became a pop-culture phenomenon. AVC: That doesn’t seem likely. WS: Well maybe not confess it to my face, but it’s still by far the best-liked thing that I have done. AVC: And it has more of you in it than any of your other projects. WS: And also, of the things that I was involved with as a writer, it was more pleasant.My plays are not so pleasant. It’s a little bit lighter in ultimate feeling. WS: You know, there’s not too much to say about it. I suppose my agent did something unusual in telling me who they really wanted. And telling me that I was the third choice. I was very, very aware that I was not the first or second choice. I mean, ordinarily, agents don’t do that, and I must admit in my case, it did make it hard for me. Because I didn’t get the sense of humor, really, didn’t understand it very well. It’s not my type of humor, so the director had to kind of coach me through everything I did. It’s by far what I’m best known for on planet Earth. No day goes by without someone commenting on it to me. It turned out to be one of the most beloved films. People had the most astonishing response to it. Apparently by following Rob Reiner, by trying to imitate him—he would do [my lines], and then I would imitate him. And I must have done it adequately, as people compliment me on it on a daily basis. AVC: What was it like acting opposite Andre The Giant? WS: Well, that, I did very much enjoy. He was marvelous. But there was something painful about his situation, because he already had lost some of his strength. Of course it was well-known that he could not live terribly long, because no one with his condition did. So it was all a bit poignant. But he was always very, very intelligent, and he was very kind to me, because I was quite afraid of certain things we had to do, and he was very, very nice to me. He was a fascinating person, because he had come from a small village in France and wanted to travel. And he quite consciously decided that in order to travel, his best option was to try to become a wrestler and that’s what he did. AVC: Did you know John Lahr through the New Yorker connection? WS: No, I knew John Lahr through Andre Gregory. And John Lahr was a supporter of my plays from the beginning. And I owed him a great deal. He introduced me to my wonderful agent, who is also a character in the film, Peggy Ramsay, who has changed my life, really. That’s the character Vanessa [Redgrave] plays in the film. So we were doing the film in the office of the real Peggy, and there was Vanessa playing Peggy, and there was Peggy, and I was playing John Lahr. It was all rather mind-boggling. AVC: She’s in the book the film was based on. WS: Yeah. And I had known [Prick Up Your Ears director] Stephen [Frears] through John Lahr. And before he made any feature films, he was working in television. And he called me up and he said, “Would you like to play John Lahr in this movie?” and I said, “Sure, sounds great.” And I read the script and I said, “This is not a very friendly portrait of my friend John Lahr.” And well, I was a little bit in a state of anxiety about the whole thing, because it was John Lahr’s own idea to have himself as a character in the film, but somehow by the time they got around to making the movie, it was not a very attractive character. And it was John’s idea to show his own marriage in the film, to show, I suppose, that some of the problems [Ken] Halliwell and Joe Orton faced were common to all couples. But somehow it wasn’t… You know, I was participating in it, but I was a little worried about it. AVC: How did he ultimately feel about your depiction of him? WS: I don’t think either he or his then-wife could’ve been overjoyed by how they came off in the film. It was not designed to paint a delightful portrait of either of them, somehow. AVC: The re-creating a lost world? WS: And his idea to show the glamorous world of the radio performers in contrast to the ordinary lives of the regular people was so inspired, and the conversation that we have looking out over New York, in which we radio actors can barely grasp the idea that someday we might not be remembered. That such important actors as ourselves might one day be forgotten is something we can’t even grasp. WS: I have no idea how that came about. I’m pretty sure I was just offered that somehow. AVC: It was the most popular TV show in America at the time, right? WS: Oh, by far. And it’s a pretty popular TV show today. I mean, it’s syndicated and it’s re-run. People have seen those episodes 10 times. And you know, somebody mentioned one of those episodes to me yesterday. It happens all the time. People know those. I mean, that was the most beautiful television program. Its sincerity was so extraordinary. And its charm was completely genuine. WS: Yes, indeed. Well that, of course, was a very beautiful character to play. And I had a very strong sense of who that character was supposed to be, to such an extent that… I was then in the TV show of Clueless, and after about 10 episodes, they changed writers and brought in a different team of directors. And there was a guy who asked me to do something as Mr. Hall that I didn’t think was very appropriate for Mr. Hall. And I was prepared to be fired and sued rather than besmirch the character of Mr. Hall. WS: They worked quite long days on these television programs. Twelve hours is normal. And if you are playing a creature from outer space, you have to show up three hours earlier to put on your makeup. And you stay an hour later to take it off. So you enter a zone of strangeness that you can’t really put into words very easily. AVC: Is it physically a torturous process? WS: Yes, it’s physically absolutely exhausting. But it was liberating to me as an actor. And I think I enjoymy own performances as that character more than most, almost more than anything I’ve done. I think I was quite good as… It liberated me to be wearing all that makeup. I was freed by it. AVC: You felt like you could be somebody else because you looked like somebody else? WS: Well, yes, what can I say? I’m representing the Jewish people, my own background on Gossip Girl, and in their version of Upper East Side New York, it’s all Christians except for me, which of course for me, it’s a thrill, because it’s also fantastically well-done, and I feel very, very comfortable with those on that set and with those scripts. For some reason it seems, I don’t know, so completely un-phony to me, compared to most forms of entertainment. Unpretentious! Completely unpretentious and un-phony, which are two different things.I hope to stay on the show for a long time, so I hope there will be interesting features of my character that have not been brought out yet. So far I seem like a pretty nice fellow. But, um, we don’t know yet. AVC: What it’s like playing a character in such a huge international phenomenon? WS: Well my part isn’t as international, unfortunately. Because it’s dubbed in Japanese when they show it in Japan, and unfortunately I don’t get to do that. So my work is restricted to the English-speaking world, unfortunately. But it’s amazing how many kids recognize my voice, just the voice. It’s remarkable. AVC: Would you say your voice is as recognized as your face? WS: No, but it is surprising that a kid will stop me and say, “You’re Rex.” I don’t really look like a green dinosaur. WS: Yeah, that was… Well, I got to sing, and we did a duet, I believe. I mean, I think we did. Inside the guy’s sperm ducts or something? AVC: Where all duets should occur.